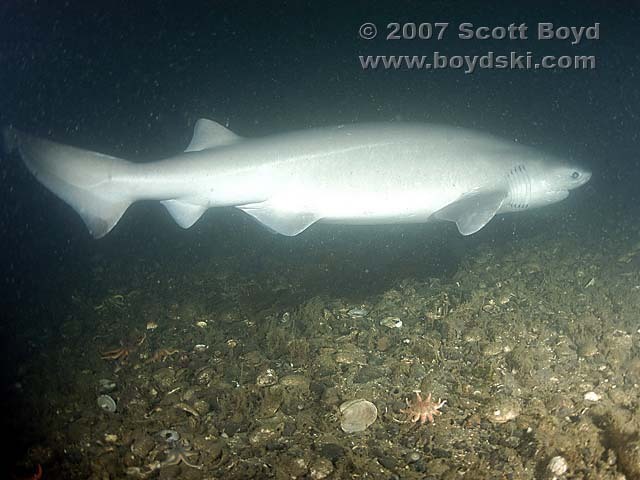 The bluntnose sixgill shark (Hexanchus griseus) is found world-wide, typically at depths of 300 to 8000 feet. Also known as the sixgill cowshark, or mudshark, we are very fortunate to be able to find these magnificent creatures at divable depths. This seasonal phenomenon (exclusive to the Pacific Northwest) coincides with our summer plankton blooms, which allows the light-sensitive sharks to come into the shallows to benefit from the local salmon and herring runs. It also appears to be part of the shark’s mating and birthing patterns. Newborns are often found in shallow waters in the summer and early fall. Many of the adult and sub-adult females are also observed by divers to have bite marks near their gills, indicative of “love-bites” from mating male sharks, which is a behavior common to most species of shark. Most sixgills encountered by divers are between 8 and 15 feet in length, weighing up to 1000 lbs. with the males being slightly smaller than the females. The largest one ever captured off our coast was just over 16’ and weighed about 1300 lbs. The sharks become sexually mature at about 11 feet in length for males and 14 feet for females. The gestation period for this species is unknown, but assumed to be about two years (similar to our dogfish). Sixgills may give birth to as many as 100 live young, which are about 2 feet long, and may live to be well over 100 years old, being a very slow growing fish. Feeding primarily on hagfishes, dogfish, lingcod, octopus, seals and cabezon, Sixgills have been observed striking from above and pinning large ling cod to the bottom. They will approach divers quite closely, shifting their course only enough to avoid bumping a diver, and while they appear to be very lethargic, when touched, may whip around and snap aggressively (so no petting the Sixgills, Janet). There are several cases of divers being snapped at, including one recorded attack (provoked) upon a SCUBA diver off of Caprera Island, Italy. 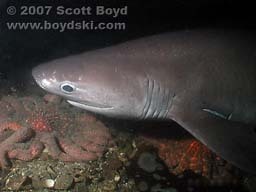 A few underwater photographers have also reported having their strobes bitten by males immediately after firing. We observed no such behavior with the docile group of females we recently encountered, who ignored my strobe firing and would actually turn and come back to investigate us quite closely (about 18”) after I quit following them. Today’s sixgill shark is nearly identical to fossils dating from the Triassic period (200 million years ago). It basically hasn’t changed much since then, and this prehistoric shark never even developed a functional iris to protect their light-sensitive eyes. Their pupils are permanently dilated to capture the minimal light available at the depths they normally inhabit. This is probably a big reason why we only see these sharks in the summer. When winter arrives and our water clears up, they must retreat once more into the dark depths below 300’ to protect their vision. So now there is a good reason to be happy with the crappy visibility we enjoy in the summer, because of it, you get to swim with Sixgills!!!! Speaking of swimming with Sixgills, we recently did a dive at Owens Beach (Pt. Defiance Park) in search of this amazing creature. We descended to about 95’ and swam slowly into the current looking for sharks. About 15 minutes into the dive, we spotted a baby octopus, and stopped to video tape the poor little guy, which was being harassed by a rockfish. At 20 minutes, we were approaching our No Deco limits, my neck seal was leaking, and we were just about to call the dive when we spotted the sinuous tail of a shark lazily swimming by. I took off in hot pursuit, following the 11’ female down to a depth of 110’, taking pictures as I went. Out of breath, and with my computer complaining about partial pressures, I swam back to my buddy, who was video-taping another shark. 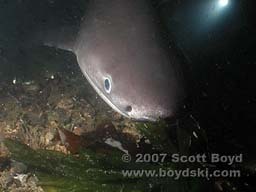 I turned and the female had followed me back to a group of about 5 female sixgill sharks. We hung out with this milling group of cat-like sharks for about 5 minutes, and several times had them swim directly at us, turning away at the last second. They seemed quite comfortable and curious around us, and I believe they are somehow attracted to our HID lights or the EMF (electro magnetic field) coming from the cameras and strobes. Most of the sharks we observed had bite marks from mating. They reminded me of cats, as they swim slowly by, rotating their primitive eyes to watch us, with their long tails swishing slowly back and forth. Unfortunately, at this depth, we really had to be heading for the surface for a little decompressing, and sadly left the sharks to themselves as we made our way slowly back to the boat. Many, many thanks to Amy for mentioning there were Sixgills at Owens Beach, to Mike and Jerry for fixing me up with the right gas at the last minute so I could make this awesome dive, and to Janet for providing surface support so we could make this dive safely!